A SENIOR public servant and magistrate are directors of a Country Liberal Party-aligned research company that “contributed significantly towards the activities of the Blain by-election”, emails and text messages seen by theNT News reveal. The company solicits corporate “memberships” worth more than $20,000. NT Land Development Board chairman Graeme Lewis is a member of the CLP management committee and a director of a private entity named in NT Parliament yesterday as Foundation 51. According to a 2010 Northern Territory Electoral Commission (NTEC) document, in 2009-10 Foundation 51 shared GPO Box 199 Darwin with the CLP Darwin Branch (which they still used in 2013) and CLP Gifts & Legacies Pty Ltd. The CLP received $13,200 for "services rendered" from CLP Gifts & Legacies Pty Ltd. In Return Receipt Details - 2012-13 - Country Liberals (Northern Territory), the AEC website records the GPO Box 199 for CLP Gifts & Legacies Pty Ltd. Graeme Lewis is listed as their accountant. It made donations of $68,000 and $9,000 to the CLP. A 2006/7 CLP Return lists a donation of $5,164 from a G. Lewis of GPO Box 199 Darwin. CLP Gifts & Legacies Pty Ltd, then at GPO Box 4194, gave the CLP $18,681.74 for "property administration". It would be interesting to know who has donated to CLP Gifts & Legacies and Foundation 51. Pity there isn't an ICAC in the NT. Perhaps the Office of the Commissioner for Public Interest Disclosures could start an inquiry. The new [Northern Territory] PUP recruits used parliamentary question time to expose the CLP for allegedly concealing political donations made via a shadowy private company known as Foundation 51. 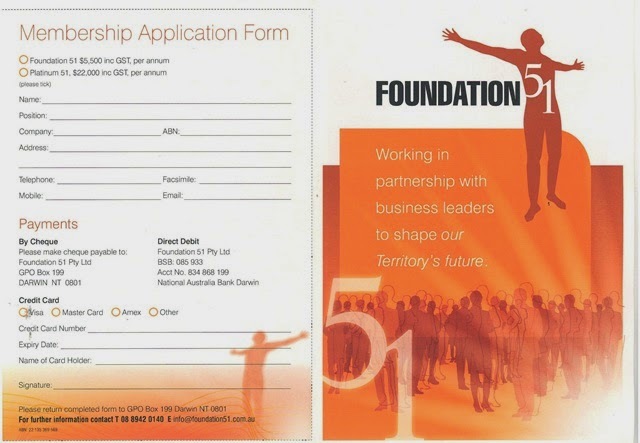 ...According to [ALP] opposition government accountability spokesman Ken Vowles, Foundation 51 is “a front company set up and deliberately designed to avoid disclosure of donations”. Vowles says there are “very close parallels between Found­ation 51 and the murky entity Eightbyfive”, established by NSW Liberals. ...Foundation 51 is not declared as a politically associated entity and has not lodged donor returns. ...Documents accessible online appear to describe Foundation 51 as “an initiative of the CLP” that shared a post-office box with a party branch. Good to see the Oz using Labor View's research. Interesting. Looks like CLP Gifts and Legacies as an associated entity do file returns with the AEC so you can see what goes on with them. Foundation 51 doesn't seem to though.